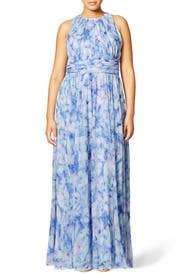 Show your creative side in this printed maxi by Badgley Mischka. Dress up the look for an outdoor wedding with metallic accessories like, Alexis Bittar's Seeing Double Earrings. This dress runs true to size. We recommend going one size up for backup (see following fit notes for exceptions). Sized: 0-14 & plus 16W-22W. 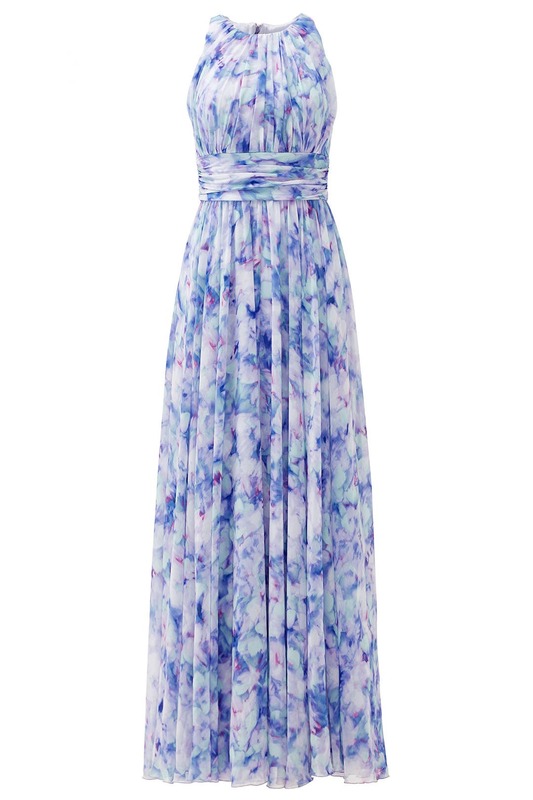 Blue Floral Silk Chiffon (100% Silk). Sleeveless. Halter neckline with hook-and-eye closure in back. Full skirt. Hidden back zipper with hook-and-eye closure. Lined. Imported. 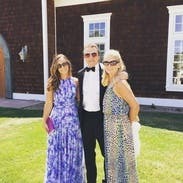 This dress was perfect for an evening black tie wedding! This dress was easy, comfortable, and fit well. While the fit is relatively simple, it's flattering and the color added some fun to it. I got so many compliments and would definitely recommend it to others for a black tie affair. I'm usually a solid 6 but opted to wear the 8-it was more comfortable and a little looser in the chest area, which I needed. 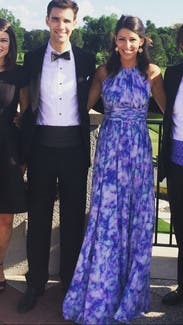 I'm 5'6" and prefer not to wear high heels, so was happy that the length of the dress allowed for cute sandals with a little bit of a wedge. 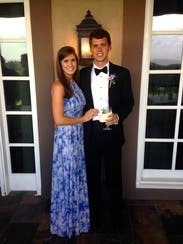 I wore this dress to a formal wedding in Charleston, SC. It was perfect! It fit like a glove and it was so easy to dance in. I'm 5"5' and wore 2.5 inch heels; the size 0 was the perfect length. I could have also worn the 2, but it was a little long. The weather was hot and a little breezy and this dress looked beautiful blowing in the wind. 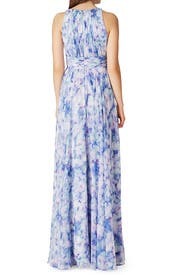 I would definitely get this dress again - in the other color - for a future formal event. 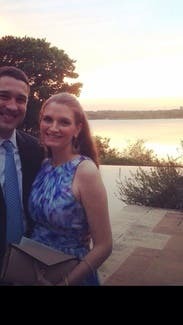 I love this dress and will rent again for a wedding in August. 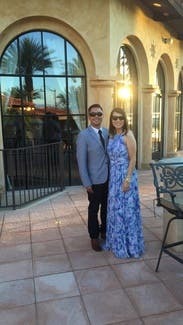 Unfortunately, it was fancier than I thought and better for a wedding than wine tasting so I didn't wear it. The 6 fit me well, although I'm usually a 4. So I suggest getting your typical size and one size up for comparison. The dress is long. I probably would need a 4/5 inch lift so the dress doesn't drag so keep that in mind shorter girls. this dress was even more beautiful in person!! the colors were so pretty. the dress was so pretty! I wore this one after a few mishaps with other dresses but RTR came to the rescue to make sure I had a perfect dress to wear! it was brand new and beautiful. The waist part where the fabric gathers is definitely a little tight but the 0 was good for me.. anyone with a bigger chest would run into a problem and should probably size up. loved this dress.. didn't wanna send it back!!! This dress was absolutely gorgeous and I got so many compliments on it. The color is darker than in the photo and is more of a periwinkle color. It was a bit hard to zip up through the waistband because it's thicker in that area and tighter. That would probably be my only complaint about the dress. The length was perfect, and I wore about 1 1/2" heels with it. It's perfect for springtime and worked wonderfully for my prom. It stood out from all the other typical, sparkly dresses there and made me feel so elegant. I'll definitely be renting from Rent the Runway again! This dress is beautiful and so comfortable! This dress is beautiful and the color is gorgeous. It is more lavender in person than the picture shows (in my opinion). I wore it to a spring wedding and received many compliments. The only trouble I had was the zipper- the fabric changes a little in the ruching at the belt area so it was harder to zip up. Both sizes fit well- I felt I could have worn either. The 10R length was better for my height than the 12 L. With the 10R I was able to wear a small 1 inch wedge heel and it was perfect. I would definitely recommend this dress! The fit is true to size and the colors are gorgeous. The only con is the polyester liner, it can make you very hot especially after a dance or two. 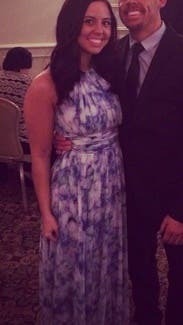 I wore this dress to my best friend's beach wedding in Puerto Rico. I received the dress with enough time to pack it and because of the material it did not wrinkle while in the suite case (did not need ironing at all). I am usually a 6 and I wore a 6, didn't even try the alternate size of 8. The length was perfect with the heels that I wore (about 3 inches). The material was a little bit heavy for an outdoor wedding, considering the wedding took place during the 3-4pm sun. But the colors on the dress were great, the dress was in great conditions. My only complaint is the dress a little tight in the underarm area. I didn't notice it was tight at first but by the end of the long night I ended up with marks under my arms. Overall a great dress. Fit true to size, comfortably snug around my ribs - the band fit higher up than around my true waist. Very long, I had to wear 3" heels and I am 5'10". The dress gives a nice shape and is very flattering and received lots of compliments! Feeling great in my outfit. The dress fit well. 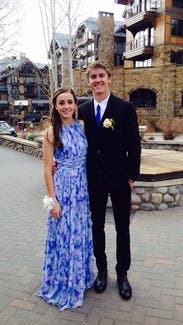 I wore some high wedges and the regular was just the right length ( I am 5'4"). I wore the 12R and the 10R would have been perfect. I usually wear a 10 in most things, but I ordered the 10L as backup which was just too long. Had many compliments and return the next day was easy. Loved the dress and the service! The colors of this dress are beautiful! I couldn't of been happier with this dress. The length of the dress was perfect with my heels. It fit like a glove once I had to have someone help me with the zipper trouble on the waist band. 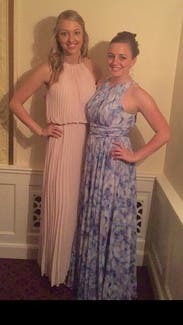 Everyone complimented me on the dress at the wedding. If the dress didn't get so much attention already I would definitely rent again! Transitions from day to evening easily. Very comfortable, full zip back. Chiffon is light, but the full pleated skirt is heavy, not very flattering for straight and narrow figures. Gorgeous color, darker blues than pictured, not really pastel. The 0R was too long, even with 4.5" heels, so I didn't wear. This dress really made the night special because it is so unique and beautiful! 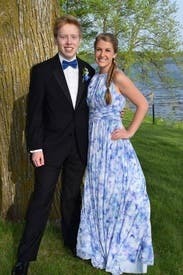 I wore this dress to prom and loved it! I got so many compliments throughout the night, even from strangers! It was a little long with 4 in heels, but I wasn't tripping on it either. There is a lot of fabric in the skirt, so it's very flowy which made for some fun pictures. This dress was perfect for my sister in law's wedding. I received compliments the entire night! Runs true to size, although the print has slightly more green than the stock photo shows. I'm 5'4, so I paired it with wedge platform heels that were approx 4 inches high and the dress grazed the floor. The silk chiffon is gorgeous to wear and has a lot of movement. Very comfortable and I was able to get away with a convertible bra in a halter configuration to support my bust. Beautiful dress, received many compliments! I LOVED this dress! 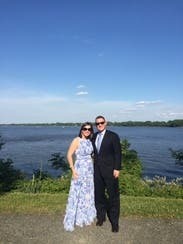 It was a little long on me, I am 5'2, so I have to wear higher heels, but it was prefect for an evening garden wedding. The colors are beautiful and I received many compliments. I would like to own this dress. I LOVE this dress! 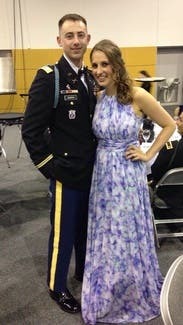 Received many compliments at a formal military ball. The liner is soft and the dress is so flowy; I was comfortable alllll night! I have a 32FF bust and this dress fit my bust PERFECTLY!! I got a long, as recommended by RTR, due to being 5'7" and planning on wearing heels. It was too long for me. I had to hold the dress up all night so I wouldn't trip. But that's the only issue I had, and it wasn't more than an occasional nuisance. Definitely recommend this dress! I caution that this dress is extremely beautiful by itself, but it was very heavy and overwhelming on my body type when I tried it on. I did not end up wearing this dress to the wedding due to the fact it was so heavy and conservative. My full bust did not help the situation either as it made me appear larger. But again, a really beautiful dress. If you're tall and have a smaller chest, rent it! I received this dress after my requested dress didn't arrive on time. The customer service was fantastic. They overnighted the dress to me. I usually wear a 4-6 in dresses, and the 4 fit me perfectly, even with my slightly large hips. The dress is flowy so it doesn't hug your hips. Very comfortable. Loved it. Beautiful evening full of beautiful people celebrating great friends. 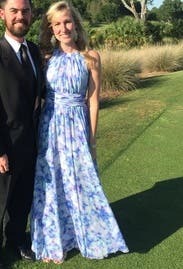 I am almost 5'8 and the 0L was too long even with 4 inch heels, but I've worn this style of Badgley Mischka dress in a 0R and it was too short with heels. It just made dancing a little difficult. Otherwise, the dress was absolutely perfect and I received a ton of compliments. I would absolutely wear this dress again! 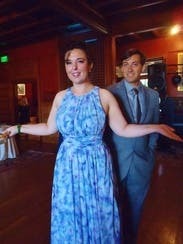 In other peoples pictures the dress looked lavender but mine came out great! The dress flowed beautifully, was super comfortable and perfect for prom. I got compliments from old ladies at our restaurant, people in my grade- it felt like everybody loved it and i definitely did- would highly recommend this dress! 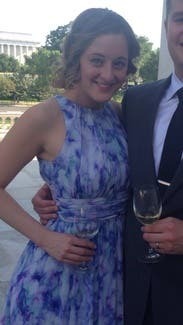 Wore this dress to an outdoor wedding! It was just beautiful!! Got lots of compliments. Loved it! GORGEOUS dress - wish I could keep it! This dress is beautiful - the colors were perfect for a spring wedding. I felt like I stepped out of a Monet painting. The fabric was light and airy and fluttered beautifully when moving and dancing. The size I typically want was out of stock, so I went smaller than usual, bit it still worked! A great dress if you're self concious about your middle or lower half. I am 5'10 and the long sizes still brushed the floor with 3 in heels - so if you want to wear flats, be aware of the length. LOVED this dress - so happy that the smaller size worked for me. Beautiful colors and so comfortable. Zipper is a little tricky. You can wear a normal bra with it. Definitely recommended. I wore this as a bridesmaids dress and got so many compliments! 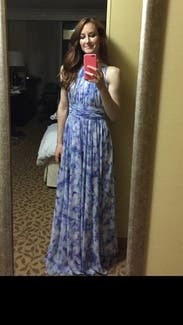 Easy to rent, arrived on time, dress made me feel elegant and beautiful. I thought the fit was spot on. The zipper, as mentioned by previous reviewers, was difficult at the waist gathering and required a second hand. I wore three inch heels and the dress swept the floor nicely. For reference, I'm not wearing the heels in the photo. 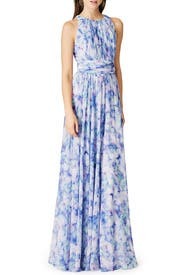 This is a great dress for a formal, summertime wedding and I can't wait to rent with RTR again! Simple and classy! Compliments galore. Loved this dress! With Vegas' heat and the wedding under the sun, this was perfect. Material is very light and flowy. Had a lot of compliments too!!! I would have preferred 4R but 6R worked too. Not much of a difference, just length wise. I wore 3in heels. Perfect dress for a wedding VIP! 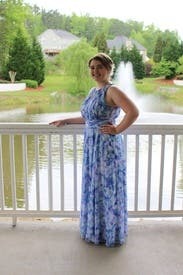 I was one of two readers for my friend's June wedding and wanted to blend in with the bridal party (who were wearing long dresses and tuxedos) but not look too much like a bridesmaid. This dress was the perfect choice. I typically wear a size 6 or 8, so I ordered both to compare as I've never worn this designer. Both dresses fit but the 8 gave me a bit more room for dancing. 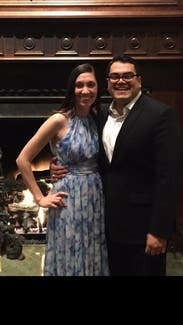 As a tall woman, the long was great in that I wore 3" heels for the ceremony without feeling the dress was too short, then switched to flats for dinner and dancing without ever thinking I would trip on the dress. I received compliments all night long and didn't want to take the dress off. A fantastic experience overall! This dress is gorgeous. I am 5'7" and 127lbs and the 4R fit perfectly. The length was perfect with small heels. I got so many compliments on this dress. I hope to rent it again! 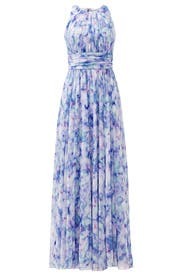 HOWEVER - one BIG issue I had is that the listing says this dress is 100% silk but it is actually 100% polyester!!! I was really disappointed about that and let RTR know of the mistake on their listing but I see that it still says 100% silk. I loved this dress! I ordered the 2 and 4, but didn't even try the 4 on. The 2 was a little tight around the arms/neck, but not uncomfortable. The dress is pretty long, so I wore 4 inch heels with it and that worked really well. The dress is stunning - probably my favorite dress I have rented. Highly recommend! I loved this dress! I had it in my favorites for awhile and when a different dress I rented did not fit, I decided to try this as a replacement and I am so glad I did. The 4 regular was not available so I went with the 4 long as I am 5'7" and it was recommended. I wore 3.5 inch heels which made the dress a good length for me, although I would have preferred to wear flats if the regular was available. 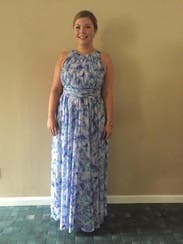 The dress fit really well and was very comfortable to wear all day for the wedding I attended. I received so many compliments and felt really elegant! I would definitely recommend renting this and wish I owned it! What a comfortable and pretty dress! I wanted to wear it all weekend. My wedges went well with the dress due to length of it. I wished I owned this dress! I wore the 8r even though it was a tad snug in the waist, because it was raining and I needed a shorter train. It looked beautiful. I liked how the colors were unique and the top sat perfectly so I wasn't tugging at it the entire night. I wore a strapless bra, but a racerback would have worked as well. 5'6" Size 12 36dd Review! This dress fit perfectly. I wore it in the 12L because the R wasn't available. Not the end of the world, I wore 4.5 in heels (first pic, wearing with heels), and it touched the ground. I would have preferred the R because the L was longer than my taste. I am pretty proportional/hourglass, with a 36DD bust, 32ish inch waist, and full hips. I had no trouble zipping this up, and MAYBE could have worn a 10, but I was very comfortable. I wore this for a wedding ceremony at a Catholic church at 2:30pm. Did not need to wear a bra, but could easily have worn a strapless, or even a regular, so if you have a larger chest, this should work fine. Ample room in the hips, the bottom flowed beautifully when I walked, and I highly recommend. Didn't end up wearing this dress. It has a ton of fabric which makes it not flattering at all. Especially if you have hips. I was disappointed because I thought it was so pretty. Maybe I should have known better given the style. Perfect in the heat and in the breeze! I wore this to my brother's outdoor garden wedding. 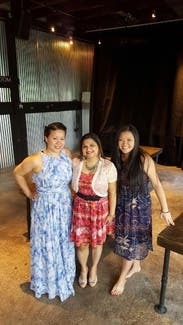 I wanted to look appropriate for pictures, but not too overly dressed, since the guys all wore sneakers at the wedding. 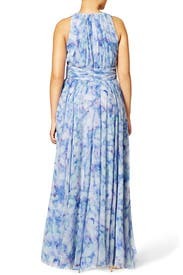 This was not my first choice, and was actually sent to me because I had 3 other dresses I ordered become un-rentable. So this was actually my 3rd or 4th back up, but actually ended up being perfect. I heard people talk behind my back about how gorgeous my dress was. I had people stop me on the way to the restroom to tell me how pretty it was. The pastor's wife could NOT get over it, and kept asking me how many people had asked me about my dress. It was light-weight enough in the heat of the day, and warm enough as it cooled down into the night. I was so comfortable in this, I ended up talking a long walk with some family afterwards without ever changing. I would absolutely rent this again, and HIGHLY recommend it to everyone. RTR to the rescue! The fit was perfect! The dress was very comfortable, I had a great time dancing in it. The color/pattern on the dress is more beautiful in person than in pictures. I'm renting it again for another wedding in August! Received so many comments/compliments. That being said, there are a few things to consider: the zipper. Yes, the zipper is extremely finicky so if you rent it, be oh so patient with the zipper. It zips up but definitely not without a fight. Next, the length. 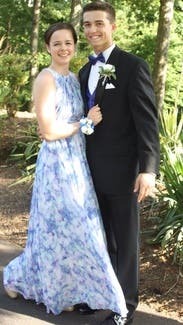 I am 5'2" and had 4 inch heels and the dress was just a tad bit too long. Not obnoxiously long but still not ideal. If you're petite please bank on having at least 1 free hand at all times to carry the front of the dress. Also, it is A LOT of fabric but that's also what makes it so amazing. It is a beautiful gown and over all I would definitely rent it again. CANNOT DESCRIBE MY LOVE FOR THIS DRESS!! You try the Warehouse Store in Secaucus-they might have it. Their prices are great!